There have been a couple of questions regarding the validity of my measuring process. 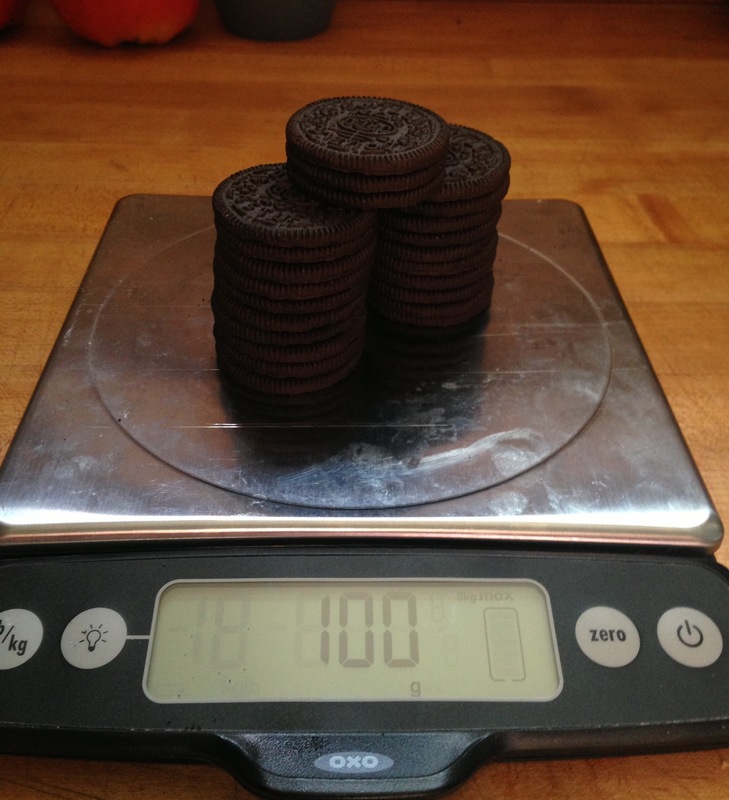 The one that irked me the most was the fact that I had never measured the weight of the wafers of the Double Stuf. Was it possible that the wafers for the Oreo and Double Stuf were different? They have a different stamp on the top. Were they different weights too? Previously I had found it very difficult to remove a wafer without any creme remnents from a Double Stuf. It always left some residue on the wafer. However, a local news channel came over (for my last interview, I’m done) and brought a box of Oreos and a box of Double Stuf. After the interview, the cameraman asked if I could unbox the Oreos and take them apart for the B-roll footage to be played while I was talking. However this time the wafers came off the Double Stuf with no problem at all. So to recalculate. 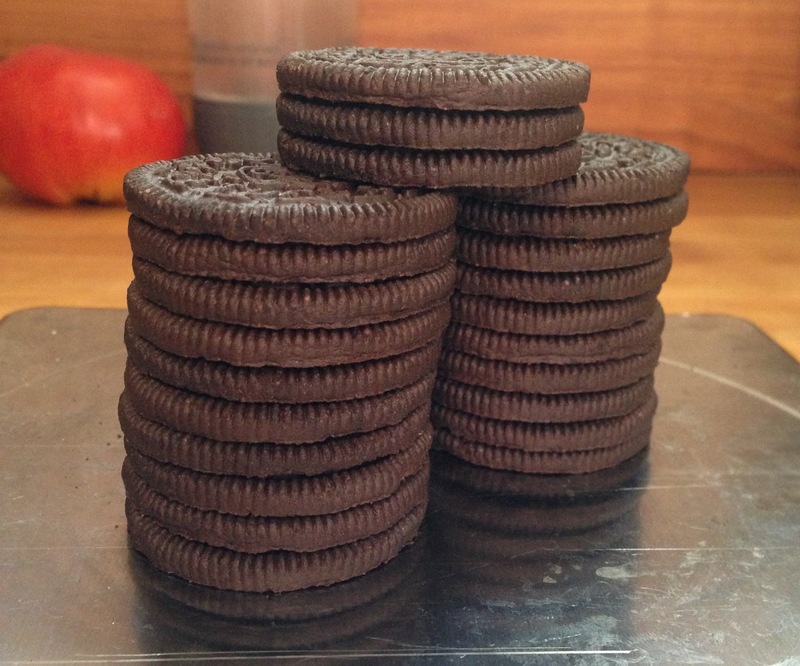 23 Double Stuf wafers weigh 100g, so each wafer weighs about 4.35 g. Meanwhile the average Original Oreo wafer weighs about 4.04 g. The average Double Stuf Oreo weighs 14.67g, and so the Double Stuf creme weighs 14.67 – 2(4.35) = 5.97 g.
DS creme / Oreo creme = 5.97 / 3.48 = 1.7 stuf. Conclusive? Heck no. Do the measurement in your home or classroom. Prove me wrong. Measure the density of the stufs’. Are they different? How much does the creme cost compared to the wafer? Which has more calories? Do some fancy statistical measurements. Is averaging the best tool to be used in the calculations? Dear Teacher: I have really enjoyed this story and it brought back memories of my own high school years (circa 1960). Wherever your career takes you, may you continue to enjoy what you do. The lives you touch will remember you, even if they forget what they learn. Trust me, I’ve been there. I came upon this while putting together an Oreo experiment for my own students (HS chemistry). Now I can tie in the concept of reproducibility AND see if anything has changed in 6 years! Awesome! How did you use Oreos in chem?